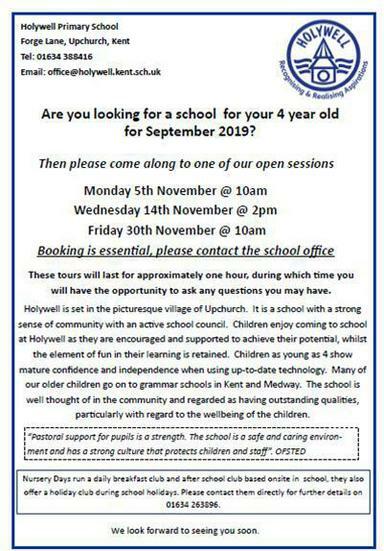 Are you looking for a school for your 4 year old for September 2019? Holywell is set in the picturesque village of Upchurch. It is a school with a strong sense of community with an active school council. Children enjoy coming to school at Holywell as they are encouraged and supported to achieve their potential, whilst the element of fun in their learning is retained. Children as young as 4 show mature confidence and independence when using up-to-date technology. Many of our older children go on to grammar schools in Kent and Medway. The school is well thought of in the community and regarded as having outstanding qualities, particularly with regard to the wellbeing of the children. These tours will last for approximately one hour, during which time you will have the opportunity to ask any questions you may have.